The PC has yet to usurp the TV. 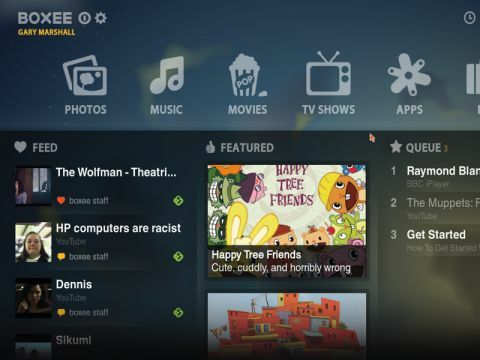 Could Boxee finally make it happen? Watching TV on your PC can be pretty uncomfortable. Nobody has a sofa at their desk, and snuggling up with your netbook in bed can cause neck and back strain – not to mention the frustration of watching your favourite show on a tiny screen with tinny sound. Let's not forget that your Sky+HD set-top box records TV perfectly well, your Wii has iPlayer for when you've forgotten to record something and video on-demand is available via satellite. But putting a PC in your living room brings many benefits. Aside from the ability to watch iPlayer comfortably without investing in a Wii, it means that you can watch YouTube videos or TV programmes stored on your hard disk on a large screen. However, Microsoft is doing a great impression of a firm that's forgotten it makes Media Center, meaning that the software has a distinct lack of any decent online services. You'd also have to pay out for a Windows licence if you wanted to run it. So is there an alternative? Boxee is Media Center on steroids. It runs on Windows XP, Vista, 7, Linux Ubuntu and Mac OS X and it can handle pretty much any DRM-free file format you throw at it. It's happy with local, networked and streaming media, and you can expand it via plug-ins that deliver anything from iPlayer to game reviews. If it puts video online, you can add it to Boxee. Boxee has a 10-foot interface, which is a fancy way of saying it's designed to work when it's on your TV and you're on the sofa. It's as comfortable with a keyboard and mouse as it is with a remote control. The interface has been given a major tidy up: navigation is simple and logical, everything looks great and the user experience is consistent. Boxee doesn't evade geolocation, but it does sit back and whistle while you bypass it: simply find a suitable proxy server online and plug the details into the software and it will cheerfully tell media services you're in places you aren't. It's not foolproof, however: as non- US fans of the media site Hulu know all too well, some sites do more than check your IP address before letting you stream content. Where Boxee excels is in the way it brings all your disparate media sources together. It doesn't care where media comes from, so you can create a media queue that moves from a downloaded TV programme to a YouTube stream. It's designed for an always-connected environment, so if it's dealing with video it can download data from IMDB; if it's playing music it can access Freedb for track listings and AMG for album art; and if you've got a hard disk full of programmes you'll be impressed by the way it recognises, sorts and adds metadata to your collection. As you'd expect from a beta, it isn't perfect. Menus are sometimes sluggish, we encountered the odd crashing plug-in and choosing local storage is more of a pain than it should be. If you want to play DRM protected media such as old iTunes downloads you'll be disappointed, and the current beta is 32-bit only. There's no sign of the much discussed BitTorrent client in the Windows version, either. There's another big omission: it doesn't do traditional TV, so if you're looking for something to record live broadcasts or to pause, rewind and resume live TV then you're out of luck. That, combined with the lack of UK media partners, means that for now Boxee is an interesting addition to your setup rather than a replacement for your set-top box. Nevertheless, it is – pardon the pun – one to watch.